My love of all things David Tennant and subsequently, Doctor Who has been well documented on this blog. Really. No, really. It has. So when I watch an episode, I'm a tad, ummmm, how shall we say... attentive? Studious? Alert? Also, given I watch most shows which I download, on my laptop, I have the opportunity to pause, look closely and rewind if something requires a second look. And then I can jump on the internet if something needs verifying. Shut up. I know that's weird. Its just what I do, ok? Anyway that's not the point of this post. The point of this post is that in the latest episode of Doctor Who, The Waters of Mars, Russell T Davies has reverted to sheer laziness and blatant plagiarism. And I for one, am less than impressed. At the beginning of the episode it has just dawned on our lovely Doctor who his new friends actually are. So there's a little flashback to articles he's read on the internet about them... first off-world colonists in history, very first humans on Mars, yada, yada, yada. And then he starts to identify them individually. First up, Captain Adelaide Brooke, played by the always fabulous Lindsay Duncan. And gosh, golly, the Doctor has just realised its 2059 and that's when she died. Well, according to the split-second cut to his memory of a website containing her obituary, anyway. So great. Hello Peter-as-Ed, nice to meet you. And this is where I start to get picky. There's another split-second cut to the Doctor's memory of Ed's obituary. Have a read. Please. Read it carefully. Looks good, huh? 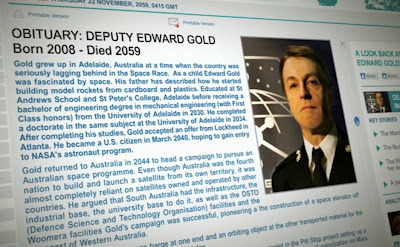 The character is an Aussie; Peter O'Brien was born in South Australia, so Russell T. Davies, or a member of his team has obviously done his/her homework and researched how behind Australia was/is in the space race, where an Australian-born astronaut might have studied, etc. Snaps to them for being thorough you might say. Or, you could say shame on you Russell T. Davies and your team. SHAME ON YOU. Because you've simply lifted Andy Thomas' biog straight from Wikipedia. And simply changed the names and a couple of the dates. As soon as I saw the St Andrew's and St Peter's references it waved a great, stonking, red flag for me. Having grown up in Adelaide and having met Andy when I visited the Kennedy Space Center when I lived in the States, I knew a bit about him. Enough to send me straight to Wikipedia to confirm my suspicions when I saw that clip, anyway. I wonder what Andy Thomas thinks of this? On one hand, he might be chuffed. He's made it into an episode of Doctor Who. Isn't that every boy's (or girl's) dream? I know it was mine until David Tennant announced he was leaving and they replaced him with that fetus, Matt Smith. But I digress. I was discussing what Andy Thomas might think of this plagiarism. I wonder if he's a little vexed by the fact that details of his life have been attributed to a character who bears no resemblance to him, other than the fact that they both work in space. As further proof of my obsession of the minutiae, another thought that struck me was how that plagiarism would fit with the standard clause at the end of the closing credits saying "The events and characters depicted in this motion picture are fictitious. Any similarity to actual persons living or dead, or events, is purely coincidental". Surely that clause prevents you from doing something like this. Until I discovered that there is no such clause at the end of the credits of Doctor Who. So presumably that rule does not apply to them and they are free to do whatever they want. However I still think Russell should hang his head in shame for being so lazy (or employing such lazy co-writers) that they just copy and paste from Wikipedia instead of creating a biography from scratch. You know, imagining something. Which is what writers are supposed to do. Isn't it? Or have the age of the internet and the budget cuts at the BBC changed all that? Let's hope Stephen Moffat isn't as lackadaisical in his approach to the finer details. 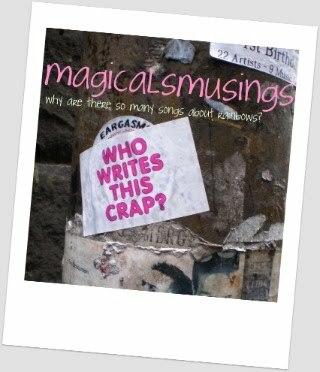 Or I shall have to write another sternly worded blog post. In the meantime, I anxiously await the End of Time and the return of the wonderful John Simm as The Master. Gosh, that was a bit lengthy wasn't it? Good on you if you managed to read right through to the end. But is the blame RTD's, or that of the production staff, who are the people who design sets, costumes, and - one assumes - websites glimpsed on screen? Well, probably the production staff. But as Executive Producer, the buck stops with RTD... I'm holding him ultimately responsible! !